Title: NJT 4112 way before rebuilding. Description: Finally found the set of pictures i took with a disposable camera and cheap film point and shoot. Description: NJT 4112 backs into Dover Yard in Dover, NJ 8/1994. Description: Power lays over for the weekend. Description: NJT 4112, an ex-CNJ GP40P unit, brings its train out of Secaucus station. Description: Westbound departing Secaucus Transfer. Description: NJT 4112, one of NJTransit's oldest locomotives moves four nearly new Metro North Comet V's at Ho-Ho-Kus, NJ 1/24/2006. 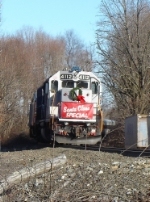 Description: The sign & wreeth are up on Tri-State Santa Special and ready to depart Port Morris Yard. Description: It's the end of a long day as the 2006 Santa Special comes to a close. Description: The NJT Santa Train heads west towards Hackettstown through the International trade zone. Description: The NJT Santa Claus Special waits in Netcong. Description: The Santa Claus Special waits to depart Netcong. Description: The Santa Claus Special splits the signals along West Dewey Ave. in Wharton. Description: Train 1025 crossing the Pompton River Bridge. Description: An eastbound NJ Transit train is pushed by the NS H02 at Morris Junction. Description: The last of the orginal 12 NJ Transit GP40PH-2 locomotives #4112 sits inside the Hoboken terminal with a consist. Description: NJT 4112 is on track 13 while the 4107 is on 11, both former CNJ GP40P's. Description: NJT GP40PH-2 4112, the one with the E60 horn, sits on 13 at the MMC. Description: First Revenue Train meet on the Pascack Valley Line at East Cole, After siding project.